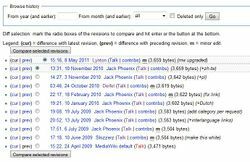 A page's history shows a list of edits made to a page. You can view the history by clicking the "history" tab. This brings up a list of edits, similar to recent changes, except only from that page from when the page was made. You can compare the edits made to pages by selecting the edits you want to compare by clicking the little circles next to the revisions. This will show you the changes made to the page between those two revisions and times. When comparing the history, you can link to this by copying and pasting the URL of the comparison. Page history is deleted for numerous reasons, if the language used was foul, links to bad websites or personal attacks are often reasons. The revision delete will appear in the deletion log too.